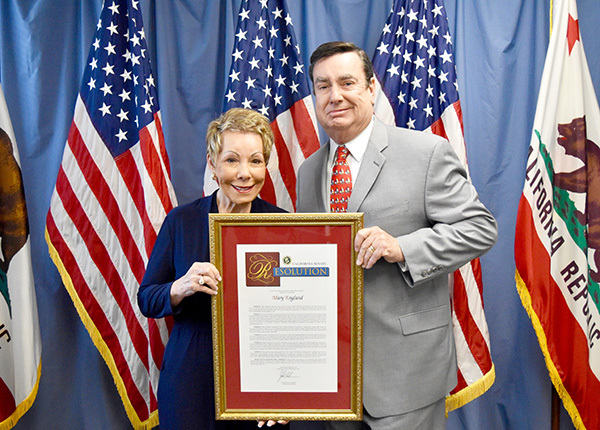 On Saturday, April 14, California state Senator Joel Anderson awarded Mary England with a Senate Resolution commending her for her achievements as the president and CEO of the La Mesa Chamber of Commerce. England’s credentials explain why she received the resolution from Anderson. She oversees two nonprofit organizations — La Mesa Rotary Club and Lemon Grove Education Foundation. In years past, she’s also been awarded San Diego East Country Chamber of Commerce’s 2007 Woman of the Year, 77th Assembly District’s Woman of the Year, and La Mesa Community Crown Award in 2011. Most importantly, she is a woman of business who is determined to build our La Mesa community. England described the obstacles she faced when she first started the La Mesa Chamber of Commerce. Now, her chamber celebrated its 10th year and she is accredited for her leadership promoting the interests of La Mesa’s businesses through the Chamber of Commerce. England advises young entrepreneurs that if they want to follow in her footsteps that they need to follow their dreams. England’s belief in this statement is seen in how she started the chamber. She then uses the chamber’s achievements to help the families and businesses of La Mesa and volunteers to better La Mesa’s youth. Simply put, England epitomizes what leadership and serving one’s community is all about. — Brenna Hatcher is a legislative intern for the office of Sen. Joel Anderson.